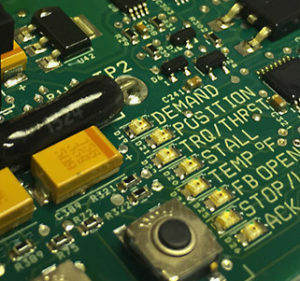 Beck’s standard modulating equipment (referred to as control option 9 on most models), utilizes a microprocessor based Digital Control Module board called the DCM-3. The DCM-3 is Beck’s third generation Digital Control Module. As with the original DCM, it provides onboard, precision, modulating control of Beck drives. It is completely interchangeable with the original, but is based on a faster, more powerful microprocessor. As such, the DCM-3 maintains all the original design features while adding a variety of new features and functions. Directly accepts 4-20 mA or 1-5 V Demand signals. Operates at temperatures -40°F to 185°F. Provides repeatable positioning control to 0.1% of span. Fast, easy setup and calibration without mechanical adjustments. Simplified troubleshooting with comprehensive diagnostics available. Compatibility with asset management systems. Drive diagnostics and operating statistics via HART or serial interface. Local pushbutton/LED interface for quick setup and error checking without the need for external interfaces or devices. Drive configuration and calibration are restorable to as-built factory setting. Drive position feedback, temperature and optional torque/thrust output are available digitally via HART protocol. Advanced positioning algorithm for even more precise drive control. Configurable 20-segment Demand signal characterizer allows the user to fit their own curve profile. Feedback inverse characterization to match the position feedback to characterized Demand, if desired. 10-segment peak torque profile for drive output trending and final control element diagnostics. Alarm masking for terminal “E” allows the user to pick and choose what status condition or conditions provide an external alarm. Configurable alarm power mode at Terminal “E” allows the user to select normally energized or deenergized alarming. Calibration/configuration in engineering units makes it possible to clone and save calibration information. The DCM-3 is a direct replacement for the original DCM and DCM-2. All control option 9 drives (Groups 11, 14, 29, 42 & 75) built after July 2016 are equipped with the DCM-3. It has identical overall dimensions and utilizes the same mounting points and connections as the original DCM and DCM-2; therefore, it requires no mechanical or electrical drive modifications. In addition to being the standard board in all new factory-built Beck drives, the DCM-3 is a direct, plug-in replacement for the original DCM and DCM-2 in older drives.